Although we all try to avoid it, many people experience permanent tooth loss. The reasons for tooth loss can be varied, ranging from illness and disease to personal decisions or accidents. No matter what the reason for your tooth loss, you need to replace the missing teeth in order to comfortably eat and talk, and you want them to look as natural and attractive as possible at the same time. At Sunridge Landing Dental Centre, we offer both full and partial dentures. Full dentures replace the entire set of teeth or one jaw full, while partial dentures are used when some natural teeth remain but a span of missing teeth need to be replaced. 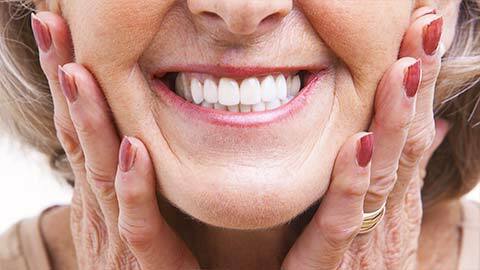 Dentures are characterized by their ease of removal and care. You simply take them out to clean or maintain them. Both types of dentures consist of artificial teeth set into an acrylic base that fits over the gums. With full dentures, the base fits down over the lower gums in a horseshoe shape, while the upper plate is fuller, with the acrylic extended over the roof of the mouth. Partial dentures, instead of being anchored by the gums, are held in place by the remaining teeth. All dentures are custom-fitted for you, giving you the most comfortable and secure fit possible. 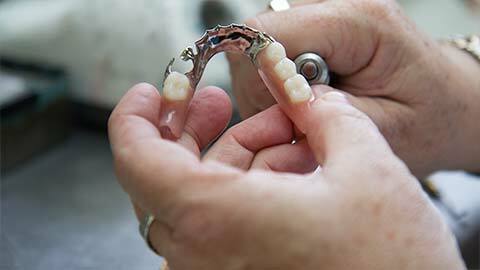 Dentures are a popular choice for tooth replacement, as they are easy to wear, attractive, and reasonably-priced. If you have permanent tooth loss, ask us about your options - a complete smile can soon be yours! If you need more information about Dentures in Sunridge Landing, contact us today.